Mayflower is a welcoming and safe community for lesbian, gay, bisexual, transgender and queer people, and their allies. Mayflower was among the first UCC congregations to vote on becoming an Open and Affirming congregation. Ensure that the message of inclusion and that All are truly welcome at Mayflower is proudly proclaimed by visual signs inside and outside the church building and by how we interact as a congregation. Advocate for the LGBTQ community by informing Mayflower congregation of issues affecting the lives and well-being of LGBTQ people both locally and nationally and by leading actions to address injustices through communication, education and consensus building. Celebrate the LGBTQ community through participation in PRIDE, the UCC annual Gathering, Transgender Day of remembrance and other significant events. 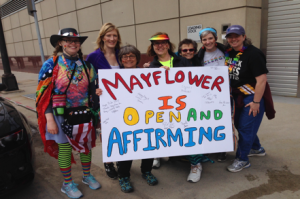 Click here to hear from Mayflower members about what Open & Affirming means to them.